Tilt Equipment Trailers for Sale by American Trailers Fairmont, WV! American Trailers offers these easy to load tilt equipment trailers, which are ideal for the contractor needing to haul a skid steer, rubber track loader, or mini excavator. 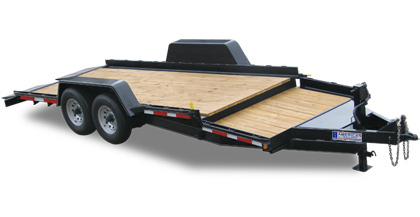 There is a 4′ fixed section at the front with a 16′ tilting section for loading equipment, for 20′ of usable bed length. This model is offered in our “Deluxe” configuration, which means it has all our best frame and component specifications. The main frame is heavy duty 6x6x3/8″ angle with 16″ crossmember spacing and a 6″ channel tongue. The coupler is adjustable and the jack is a 12K drop foot heavy duty unit. This trailer has 7,000 lb. drop axles for easy low height loading along with heavy duty slipper spring suspension and 16″ 10-ply rating radial tires. Other premium features include a toolbox with lockable lid, US made sealed modular wiring harness and rubber mount lifetime LED lights. These tilt equipment trailers are designed to allow you to carry an attachment or a pallet of building materials or landscape materials on the front section and your machine on the back.